A rare moment caught on camera while we were just talking. I don’t even remember what about. So, Spencer has been sick. For most of the month of December he seemed like his was going through one thing or another. As a result, he was acting out A LOT. He handled changes with even less flexibility than usual. He threw fits at the slightest provocation or response in a way he didn’t want. It was a little rough. We honestly were going a little bit nuts wondering where our little boy who had been doing so well had gone. We’ve figured it out. He was SICK for most of the month of December and he got to totally thrown off of any routine we had had when school let out for Christmas and his uncles came to visit. So, it would seem that all of those thing combined in it a perfect storm for meltdowns and acting out. We only realized all this after the first week of school finished. To start the week, we moved to an 8am church meeting time, and he did wonderfully well. He is at his most cooperative in the morning. Then, he proceeded to have the most AWESOME week at school. 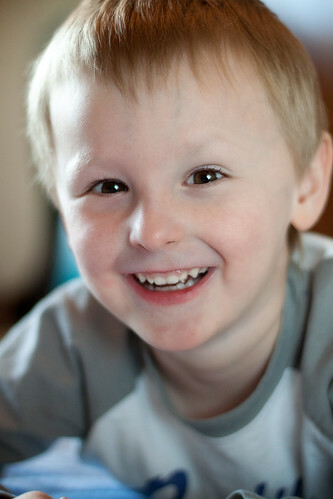 His teachers told me everyday what a good day he had. 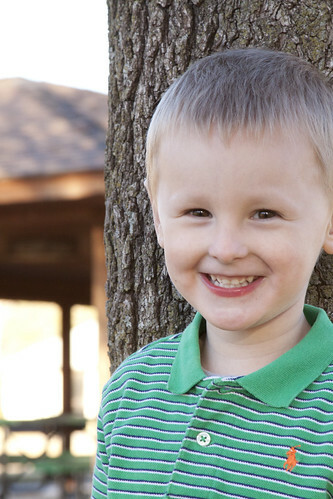 We are so happy to have Spencer back, and we are looking forward to continuing to teach him. He didn’t regress over Christmas at all. It was just a reaction to all the insanity that illness and holidays can bring. 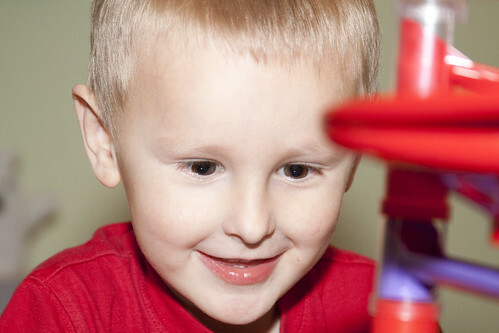 We are looking into getting him into a social skills class so he can learn more skills and hopefully keep them up over the summer when we don’t have school to count on for his extra practice. 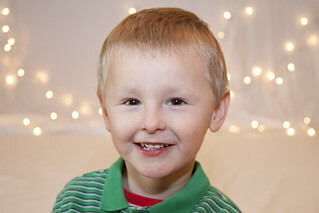 Funny thing about Spencer and photos: To get a smile out of this boy, you often have to tell him HIS knock knock joke. Why he thinks this is funny we don’t know, but he thought of it and thinks it is absolutely hilarious. Thinking about what has happened to me and the changes that have happened really makes me wonder how much my life was really effected by my Chiari. As a quick overview here are some things that have happened since my surgery. It is a really big deal that I got pregnant and didn’t have any complication during pregnancy. That was one of the firs things my neurosurgeon asked me about at my year and a half follow up. Although, I did have a slight vision weirdness that landed me at my neurologist’s office and the ophthalmologist’s office near the end of my pregnancy. But we all decided to wait and see if it got better after I had the baby and it did. If you would have told me anytime before I started running that I would actually enjoy it and crave exercise, I would have told you that you were a little bit nuts. I loathed exercising ESPECIALLY running. I always felt like it was a major punishment, and perhaps it really was considering my brain’s situation. I am extremely grateful for my new found enjoyment. Life is looking really great, and I’m so grateful we were able to do something about my Chiari and for the skilled surgeons who were able to help me. 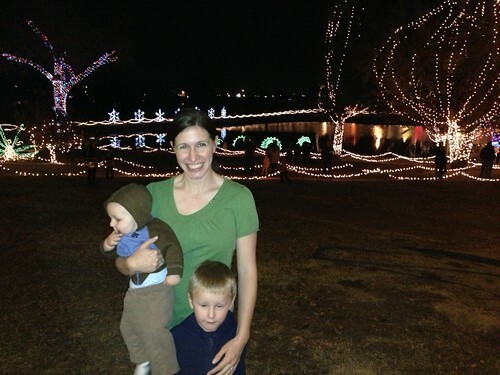 On December 1 went to Chickasha to see the lights like we do every year. It was crazy since it was only in the 60s. We had light jackets for the boys and that was it. We are used to having to bundle up with scarves, hats and gloves. 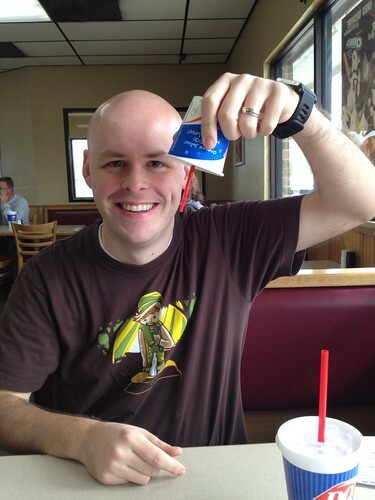 We also went to Dairy Queen, since Chickasha has the closest one to us. During December, Spencer has an elf friend named Christopher Popinkins who comes to visit. 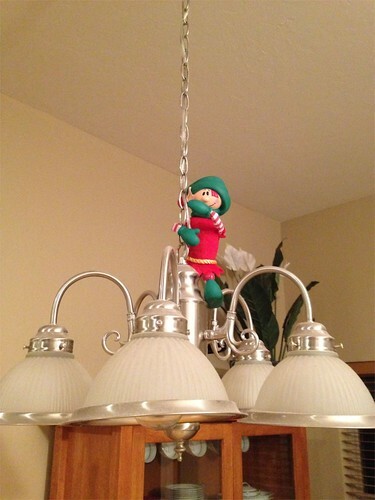 He’s a hide and seek elf like the elf on the shelf but MUCH less creepy looking. Spencer LOVES getting to find him every morning. It was such a fun thing to do every day. 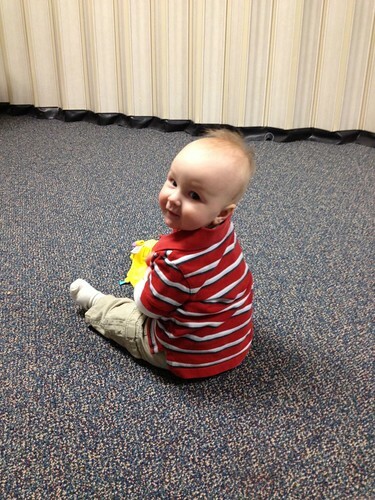 Matthew, darling boy, mastered sitting up this month. We thought he would have learned to crawl by Christmas since he was really trying, but he hasn’t done that yet. 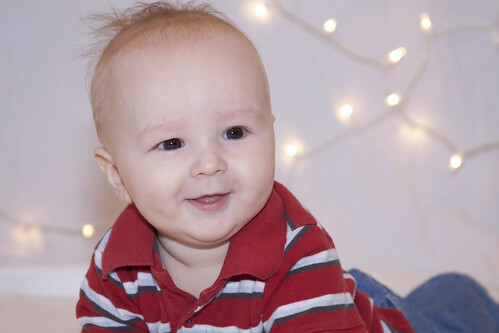 He gave us a break in his teething until shortly before Christmas. And now he has got one of his canine teeth and has 5 teeth and is working on 6. Matthew LOVES to eat. We’ve nicknamed him Chow Hound. He seems to like everything we’ve ever given him to try. He’s reacted most negatively to avocado (Spencer’s fav as a baby) and most positively to Oatmeal baby cereal and applesauce. The weekend of December 8th, Adam and I pawned the boys off on my parents and a friend of ours (later in the night since my parents had a party to be at), and went to a Lord of the Rings Extended edition marathon. We watched all 3 movies from 10am to 11pm. We had an hour between each movie. It was along day but a great day. Alas, that’s about when we started getting sick. 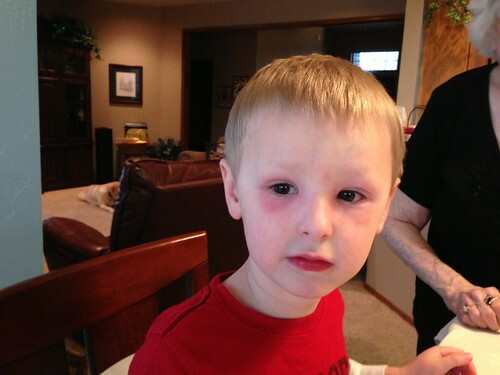 Spencer started the weekend of the 8th with yucky puffy eyes and just kept being sick until a few days after Christmas when Matthew started. Adam and I got it shortly after that. As of January 6, we are just getting to the tail end of all the sick. The next weekend was my birthday! So, for Friday night dinner, we treked everyone down to the south side of town to my favorite Mexican restaurant. The next day, I completed my first 5K run and finished the Couch to 5K program. Then, Adam as a birthday present to me, sent me off to get my hair cut and a mani-pedi while he hung out with the kids and cleaned the house for me. It was awesome. 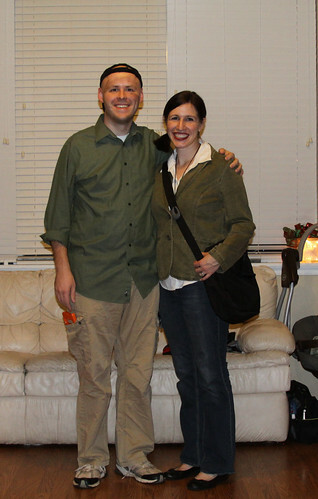 That night, we went over to a friend’s house to play our favorite board game, Arkham Horror, dressed as our investigators. Crazy fun! In the above pictures, Adam is dress as Wilson Richards, the Handy Man. I am Ursula Downs, the explorer. 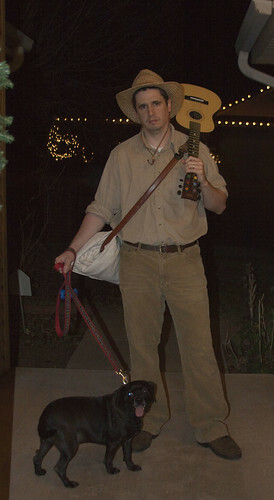 Then a few minutes after being admitted into our friends house, Justin comes knocking on the door dress was Ashcan Pete, the drifter, with his dog Duke (he’s really named Pugsley though). 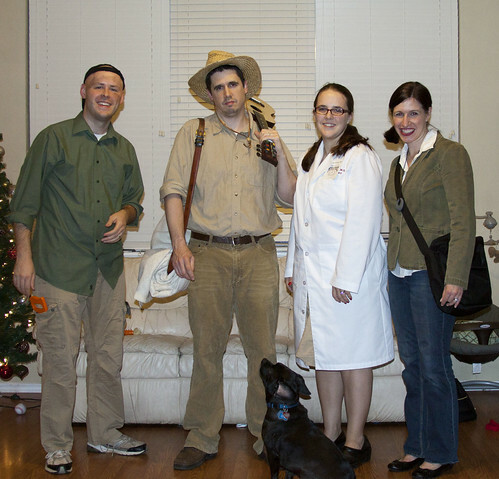 🙂 In the group picture, you also see Jaidi dressed as Kate Winthrop, the scientist. She even has her white coat labeled as Miskatonic University where Kate works. 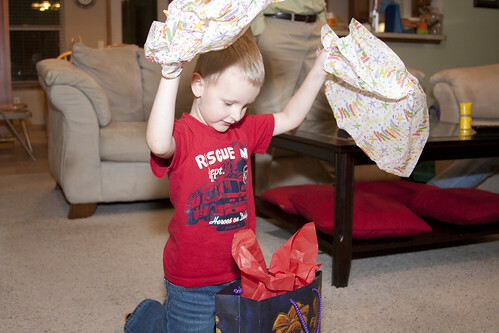 Justin and Jaidi’s kids even had their blankets draped over their heads like the cloak of a cultist. It was pretty fun. The next week was crazy for us. 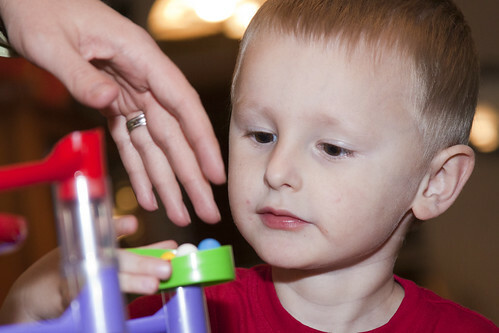 On the 18th, Spencer had his very first Christmas program. We were so nervous how it would turn out. And it turned out about like we expected. He was completely over stimulated (so much noise, too bright lights and a little pressure) and didn’t want to sing. He cried and hide and basically threw a fit. Adam actually calmed him down enough to get him to go on stage for the last 2 songs (with Adam) but not sing. I know Spencer knew the words and the actions. His teachers told me on the days that he surprised them and actually sang with the class. On the 20th of December, Adam basically left us to spend the next 3 days rehearsing and performing the Joy to the World choir concert. Thursday night, he went to the South Stake Center to rehearse from 6 to 10 with Craig Jessop for the first time. 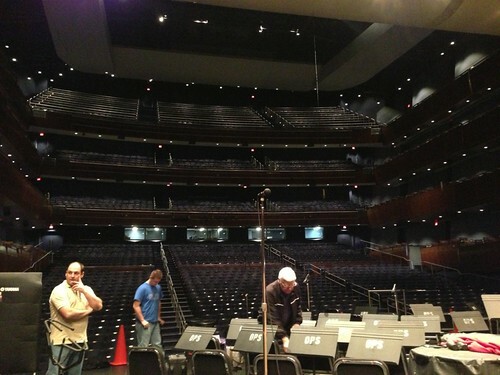 The next day, they were at the Civic Center Music Hall for their “dress rehearsals” from 2 to 5 and then from 6 to 10. They preformed 2 shows on Saturday. It was an amazing experience that was very well received by the community. My brothers and their wives came on Saturday, and we had a great week with them. Christmas was really great, and we had a wonderful time hanging out together. there were lots of pictures taken, but they made it all the way back to Provo before anyone thought to do anything with them. So, those will have to be a separate post. We’ve had a great month, an awesome year and are excited to see what 2013 holds for us. 4 years old and 6 months old for nearly a month! 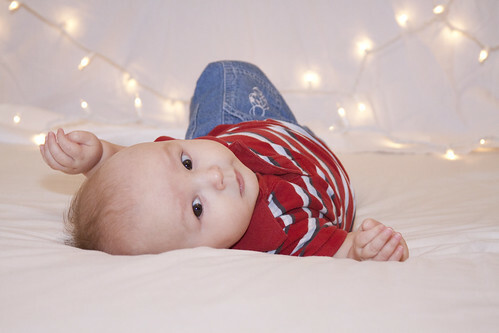 So, I’ve been a little bit of a slacker about getting these things posted and getting pictures taken of my darling boys, but with the help of my mom and my husband. I was able to get some good pictures of both boys over a couple weeks. Let’s start with the big ole birthday boy Spencer. He turned 4 this month!! It’s seems to crazy that I have a 4 year old, but I do. He is crazy funny, and sometimes a little frustrating. He is the best big brother and most of the time his a great helper for his mommy. He learned how to use the potty. Yeah! What is your favorite color? slimy things (our most recent batch of slime is green, but I’m pretty sure his favorite color is orange). What is your favorite movie? [Curious] George, the show not the movie. The George movie is scary. What is your favorite book? the dragon book (not sure what book this is, but I’m pretty sure his favorites are Curious George books). 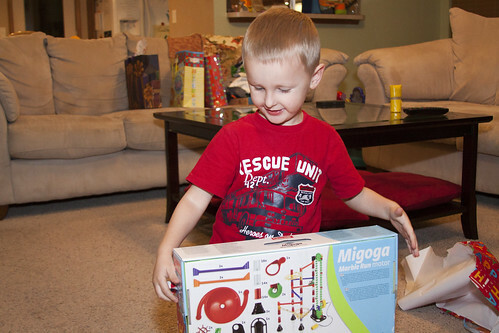 He got a marble track which is LOVES and some Imaginets (shaped magnets that you build pictures out of). He also got plenty of clothes, but we were trying to only get him a couple toys that we knew he’d like and actually play with. It seems to have worked this time. 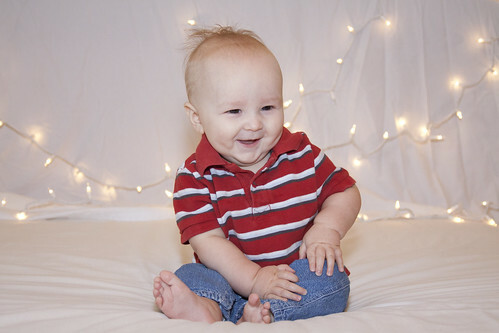 Now on to my little cutie, Matthew. 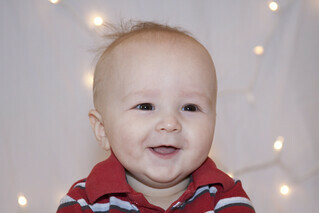 He’s six months only now. It’s a little crazy how he just fits and it seems like he’s always been here. 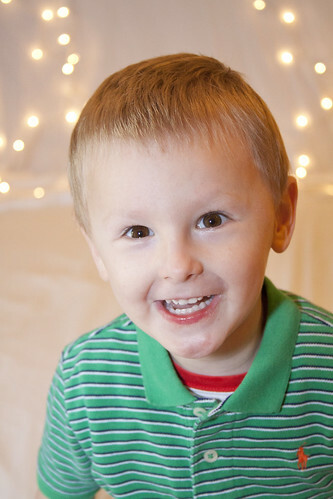 When I think about the time before we had Matthew, it almost feels like something is missing, ALMOST. It wasn’t at that point, but anyway. Started November with no teeth, but finished it with 4! And for the best part. More pictures of the little cutie. I thought this would be interesting to see side by side. Brothers. Aren’t they cute? 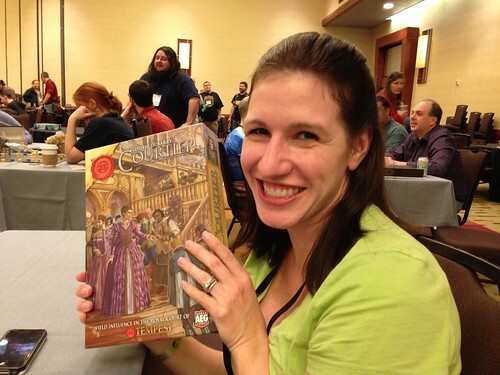 Adam and I were fortunate enough to be able to drive down to Dallas the week before Thanksgiving attend to attend the annual Board Game Geek Convention (BGG Con). What does one DO at a board game convention. Well, you play board games! 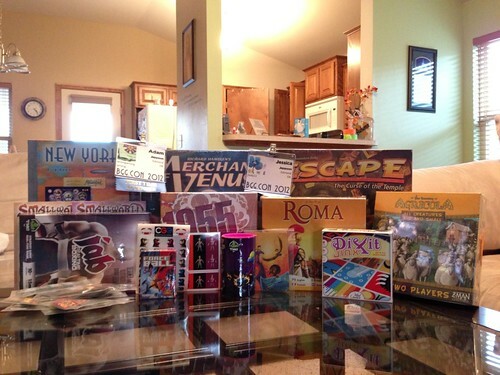 Lots of board games. Not like Yahtzee or Parcheesi or anything like that. 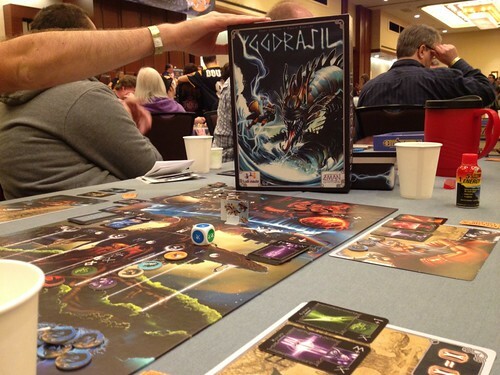 We played games like ones that have already made appearances on the blog. 🙂 I’ll give you a synopsis of our trip and the games we played. But I will tell you, we had the best time, and would love to be able to go back next year. 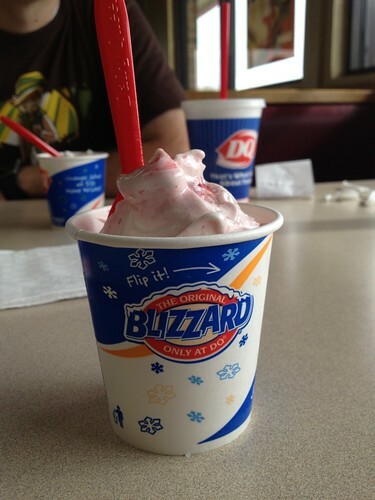 First, on our way down, we ALWAYS stop at Dairy Queen since the closest one to us is at least an hour away. We miss Dairy Queen. It reminds us of our dating and newly wed days in Rexburg. When we got to the hotel, it was too early to check into our room. So we went and checked into the convention, and we each were given 4 games from the prize shelves. Thank goodness we had a car that we could deposit those games in and so we could look around free of the burden of carrying games. We then went into the main gaming room. And found a players needed flag and were taught how to play Hoo Yah! It wasn’t our favorite game, but it wasn’t bad. The interesting thing about this game was the man who taught it never looked at me (Jessica) while explaining the rules. EVERYTHING was directed at Adam. He seemed a little shocked every time I spoke or had a question or idea. He got used to me by the end, but it was a little funny. 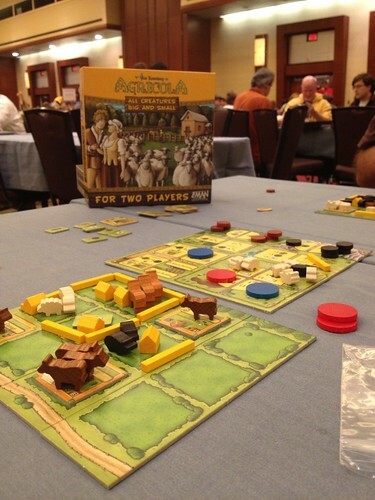 After a break to check into our room and take care of nursing momma business, we played Argicola: All Creatures Great and Small. This is a two player game, so it was just us. We got the game from the library, and sat down at a table to learn the rules since Adam was already kinda familiar with them. We bought this game at the Con. It’a good one, we ended up buying it. After dinner, back on the bus, we ran into another couple, Scott and Susan, we rode out with. They turned out to be from Oklahoma City as well. And we had a nice conversation. We went to the library and got Dungeon Lords and the new expansion we were excited to try. But we ran into Scott and Susan and ended up teaching them how to play Dungeon Lords. It was great fun. Dungeon Lords is just fun, but a bit complicated alone without adding the expansion into it. Only a little bummed we didn’t get to play that. It’s always more fun to play with more people when you can. Results: Adam and Susan tied for the win, Jessica and Scott were so pitful it didn’t merit recording their scores. That was our last game for the day, and we went to bed. We woke up rather leisurely, and that was great for us not having kids wake us up. We left and went out to breakfast and to visit the Dallas Ikea. It’s a good thing we took Adam’s car and didn’t have room to bring home some of the stuff I was eying. We got back in time to do a couple things. We attended the Escape Experience where we learned how to play Escape! and get a chance to win some cool stuff. 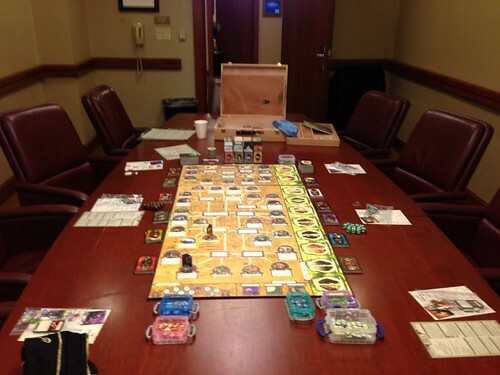 And then we headed up to grab our Arkham Horror game and set up for our epic 7 player game of Arkham. We were teaching 2 people and 2 of our players had dropped out and we were down to expecting 5. Well, we had two players wander by and ask to play too. AWESOME! Now this is not a short game with 4 people. With 7, it should have taken around 4 to 5 hours to play. It took us 2. It was the EASIEST game of Arkham we have ever played. It was a little ridiculous. Everyone was getting the rolls they needed and beating everything. o our collection soon. Well, maybe Love Letter. It’s a really easy filler game to cleanse the palate between games. e called Tokadio. It’s a track game, and you’re trying to make it to the end of the track making as many stops as you can. It was fun. The people we played with were hard to understand, but I won!! After a quick breather and dinner at Applebees (after which we swore we would not leave the airport in our car during rush hour again!) 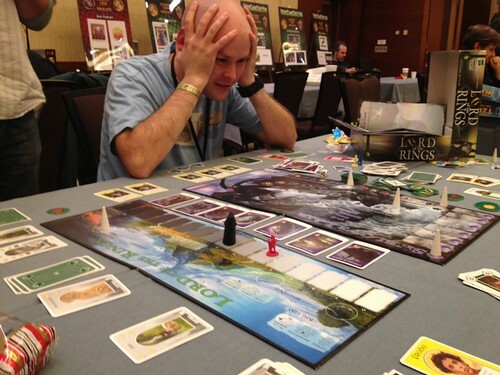 We went browsing the games library and found one of our favorite games, Lord of the Rings PLUS an expansion, Friends and Foes, we’ve been wanting to try. We checked it out, grabbed a players wanted sign and went about setting it up. We got two players, Erik and other Adam (as he was called later on), and had a very pleasant time teaching them how to play and getting beaten down by Sauron. In the end, all the Hobbits died and Sam (the last hobbit left) made it halfway through Shlob’s Lair by himself. After our grim defeat, we called it a night. We got up pretty early, had breakfast and made a new friend in the process. Alas, I don’t remember his name, but he was by himself behind us in line for the breakfast buffet. We invited him to come sit with us when we got a table so he could get to the flea market in a decent amount of time too. After breakfast, we went to the flea market. WOW! That was a mass of people and lots of money changing hands quickly. We found a couple games of some friends, and we were done there. 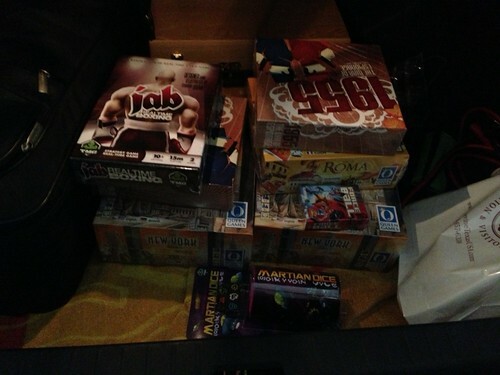 Stashing their stuff in our car, we then wandered into the main game room and found a couple poeple looking for players. We play 3 games with them. The first was called Bohnanza. It’s basically a trading and collecting game. Adam did not like this game at all. He doesn’t like bidding games like that at all. Lastly, we played Love Letter a few times. 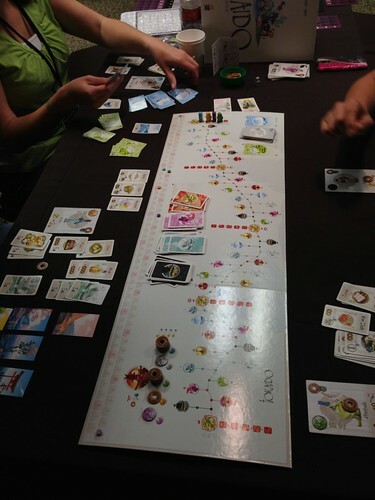 It’s a small card game where you are constantly trying to find the princess or a roll that is higher than yours. It’s pretty fun. Very short, very fast. After that we had our 2 hours shift working in the game library. It was SO much fun. I loved being able to talk with people about what they were checking in and out. There were a few people who actually benefited from me knowing about a game. 🙂 We even ended up having to sort out a game that got mixed with it’s expansion. It was a really fast two hours, and it was great fun. 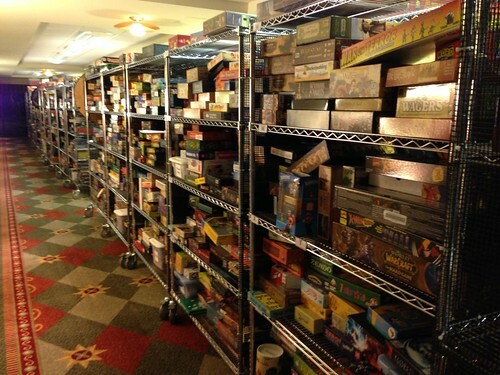 This is a shot of one side of the games library. It was amazing how many games there were. When I shift ended, we decided to eat relatively big lunch/dinner so we didn’t have to worry about it during the prize giveaway later. After lunch/dinner, we got the game The Road to Canterbury. I was not a fan. I think I just didn’t really like the theme of it and the mechanics were just weird to me. This just wasn’t my game. Adam had read the rules before, but wasn’t extremely well versed, so we were kind of learning on the fly and that didn’t make things any easier for me liking the game. After that, we were both in a sour mood. So I went to pick out a “light” game to wash the bad taste out of our mouths. I came back with Yggdrasil, not a light game. But we were both a little more enthused about it since we’d played it on iOS before and felt like we could handle it. As we were setting up, Other Adam (from the LOTR game the night before) ran into us, and we asked him if he wanted to join. He agreed and we played. We had to pause mid game for the awards and giveaway, during which we didn’t win anything, and we thought we had things well in hand when one of the Enemy Norse Gods moved across a threshold we weren’t paying attention to, and we very suddenly and anticlimactically lost. After we cleaned up this game, Other Adam brought out a game called Coup which is similar to Love Letter in that you have a role card and you are trying to be the last person standing. The difference is you have to use money to do things instead of the influence of the person on your card. After this game, Adam and I went and got Taluva. We headed up to the room so I could take care of Mommy-type business while Adam learned the rules. It’s a fairly simple game so it didn’t take long. 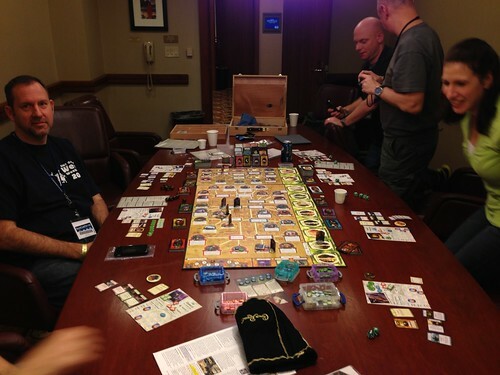 Then we took it back down the main gaming room, grabbed a players needed sign, and started setting up. We got two other people to play with us, Linda and Norman. 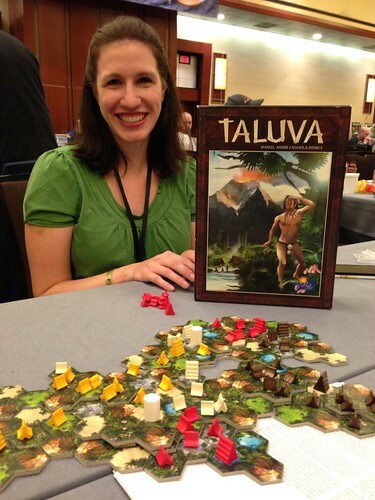 Taluva is a tile laying and a space crowding game. You lay out a tile and then expand your settlements. The cool thing about this game is that you get to build up as well as out. The goal is to lay out a certain number of certain types of buildings. The game ends when one person has placed 3 of their temples. Linda beat us all. 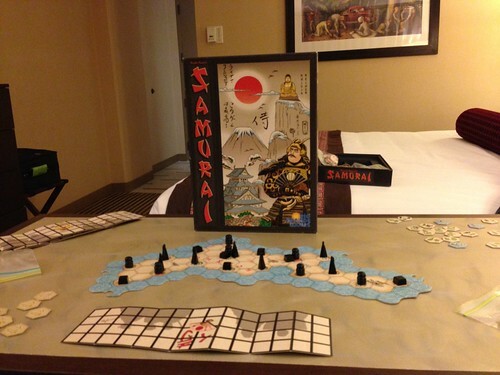 We cleaned everything up and then grabbed Samurai and headed back up the room to play in the quiet. 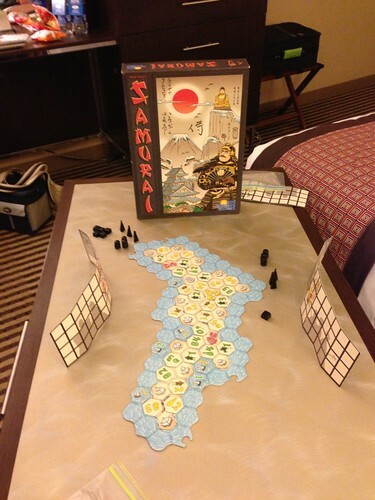 Samurai is a game about laying out influence around an island to gain rice patties, Buddhas or towers. In the end, I won by ONE rice patty! 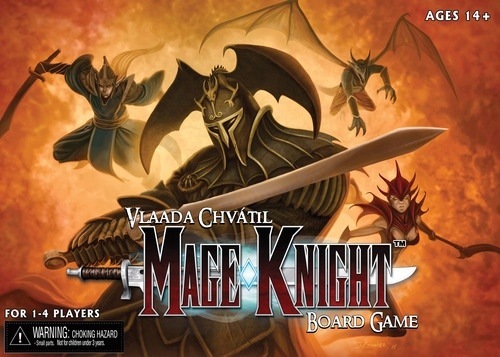 It’s a fun little strategy game. I liked it. Results: Jessica, by one rice patty! The next day, we returned the game and headed back to reality. It was a great way to spend a few days doing our favorite thing. We will be going back. It was pretty awesome.